Director: Harold Ramis. Cast: Bill Murray, Andie MacDowell, Chris Elliott, Ken Hudson Campbell, Angela Paton, Stephen Tobolowsky, Marita Geraghty, Robin Duke, Harold Ramis. Screenplay: Danny Rubin and Harold Ramis (based on an original screen story by Danny Rubin). So few American comedies even start from an ambitious concept. Even fewer of them maintain so much energy and engender such good will as they push their central conceits in so many surprising directions that you genuinely have to keep watching to know where things will wind up. On two counts, then, Groundhog Day distinguishes itself from the popular pack, and it's dispiriting that amiable but unadventurous entertainments like Dave and Sleepless in Seattle scored the Original Screenplay nods that rightfully belonged to Danny Rubin and Harold Ramis for their flexible, layered, and very funny riff on boredom, idealism, despair, self-contempt, and some version of self-contentment. 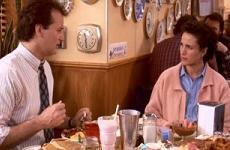 From the outset, the humor in Groundhog Day operates on several registers. Bill Murray starts off beautifully, delivering an undisguisedly and uproariously sarcastic weather report for his local-market Pennsylvania news show. I assumed his routine was an off-camera exorcism of stress and bitterness, so the joke only intensifies when the camera pans left and we realize this brutal clowning was actually broadcast. At ever larger levels, Groundhog Day persists in this act of juxtaposing this kind of pseudo-standup comedy with some darker and often meaner satirical impulses, such as tacitly or not so tacitly making fun of people within the movie and in the audience who enjoy banal traditionsto include most Hollywood movies, though all will be forgiven, tastes re-validated, and claws retracted by the film's end. Still, Groundhog Day already evinces a deft ability at balancing several strains of comedy even before the onset of the film's central, absurdist conceit of a day that simply won't stop repeating itself. Edited with a light touch and astonishing economy by Pembroke Herring, Groundhog Day has great, unfatty fun with Murray's attempts to exploit this unexpected space-time wrinkle in Punxsutawney, Philadelphia, whether by rebuffing soul-killing small talk before it starts or cribbing all the answers on Jeopardy! or getting away gleefully with crime and crass deception or rehearsing romantic evenings over and over until he finally gets them right. I appreciate that the script has the guts to accompany Murray into his various cul-de-sacs of hedonistic abandon, sexual manipulation, existential nausea, philanthropic epiphany, and humbled romanticism, and that it nervily packages the latter as an almost inseparable blend of the character finding his truest calling and of his relenting to what everyone at the beginning of the movie faulted him for not wanting. I also like that Murray's transformations are so thorough and so persuasively staged, without any excess hinting that the movie is usually holding even more tricks and tonal gambits up its sleeve, that the movie works as a kind of canned commentary on several genresthe romantic comedy, the drama of hopelessness, the male-menopause slapstick, the small-town spoofall of which Groundhog Day, for a while in each case, seems destined to inhabit. In a brisk 100 minutes, Ramis gives his audience about three hours' worth of story, conflict, merriment, reversal, and seriously spiked punch, and the stamina of the film's pacing (comically as well as storywise) and its steady, flavorful transitions from scene to scene place it high on any year's list of popular, accessible studio filmmaking. "Canned," though, is an operative word here, and as inspired as the writing and the cutting often are, I wish Harold Ramis were at all susceptible to genuine stylistic inspiration. The movie has the virtue of consistency and coherenceallied, within the movie's ambivalent but increasingly traditional ideology, with the virtues of smalltown American lifebut, compared to other smugglings of high-wire absurdism into a pop format like Being John Malkovich or Eternal Sunshine of the Spotless Mind, Groundhog Day palpably lacks any kind of directorial verve. The metaphysical anomaly that tyrannizes the protagonist's life encroaches only partially on Ramis' nervous system, and not nearly enough on Murray's performance. Murray's bearing, his style of delivery, and his mood rarely take sufficient stock of everything his character has experienced and tried and wearily forsaken and tried again, nor of the enormous amount of time that he has lived, in contrast with his endlessly rebooted neighbors. Even The Truman Show, in its ostentatious designs but also in its least mannered moments (Truman with Marlon on the unfinished highway, Truman with Lauren in the college library), placed the camera and fiddled with color and fine-tuned its sound so as to tug, sometimes very subtly, on our disturbed sense of the normal/paranormal divide and to draw us into the headspace of Carrey's Truman in a way that Murray's Phil never invites. The actor keeps up comfortably with the motions of probably the most inspired script he's ever tackled, and occasionally, as when driving around in a stolen picku with a kidnapped groundhog at the wheel, he emits a chuckle or changes expression in an instant of real spontaneity. But the project hasn't cracked him or opened him out the way Rushmore and Lost in Translation did, and while he carries the movie very well from sequence to sequence, he doesn't deepen the movie the way a more game or less perpetually skeptical actor might well have done. One could say the same of the photography, and the story construction: solid all around, truly inspired at moments, but oddly reined-in or lacking in energy at others. I can see the argument that Groundhog Day is more distinctive and perhaps more faithful to its subject by staying so determinedly mundane, refusing to flaunt its metaphysical inclinations in the way that Truman and the Charlie Kaufman movies all do, for better and for worse. And yet, aspects of Groundhog Daythe perfunctory music, the under-realized second-tier characters, the hammy schtick of Stephen Tobolowsky as an indefatigable insurance salesman, the half-baked attempt to make Chris Elliott pan out as a comic satellitetip way further in the direction of standard-issue than seems strictly justified, as though Ramis & Co. are not fully aware of the script's exploitable potentials or else are apprehensive about "going too far" and losing their audience. Perhaps it goes without saying that if Groundhog Day had been made in the 1930s, maybe by Leo McCarey and maybe with Irene Dunne or Jean Arthur as Rita, the TV producer and dawning love interest of Murray's weatherman, she would have been a fully realized character and a force within her own right, comically and also psychologically. Andie MacDowell isn't a Four Weddings-style wash in the part, and at her best she makes Rita's dreams of simple comfort seem genuinely comfy, but she never effaces the lingering dream of what Groundhog Day might be like with two lead characters instead of one and a half. Again, I see the argument that Phil's alienation, even before his supernatural travails commence, recommend or underwrite the movie's tactic of thinning out or closing off the other characters. He's cut off, ungenerous and unperceptive, and is perhaps intended to remain so. Certainly the film remains solipsistic on Phil's behalf, even when he outwardly seems to have graduated into adult sociability. But by the time the movie ends where it ends, with a conspicuous if quietly ironized proclamation of previously suspect ideals, I find this argument harder to buy. And so, from the looks of things, does Murray.